Sleeping in the Snooze Cubes at Dubai airport is genius, both if you only plan to take a nap for a few hours, or overnight. As it is inside the terminal, it is convenient if you are short on time. Staying overnight, you do not have to get up extra early, calculating the time to go through security. You are already set! The first time I heard about boxes to sleep in at an airport, was in Japan 10 years ago. I found it brilliant, but I thought it was a Japanese thing, as they tend to try to make the most of their time. It was added to my bucket list, and when I traveled through Dubai on my trip to Sri Lanka a few months ago, I learned about the Snooze Cubes there. So, when I again found myself in transit in Dubai on my way back from Thailand, I of course had to try! The nice and helpful receptionist walked me to my room, and offered to wake me up in the morning. Unlike the capsule rooms at Narita Airport in Tokyo, the accommodation in Dubai is in actual rooms, with a bed (obviously), TV, music, internet, power outlet (fitting most contacts), and space to store your luggage inside. The image on the wall and the make-believe window with view, makes it look bigger. That is good news if you are a bit uncomfortable in small rooms. To be honest, I was so excited to finally stay there, that I had trouble falling asleep at once! Evidently, I soon did anyway, and slept like a baby! 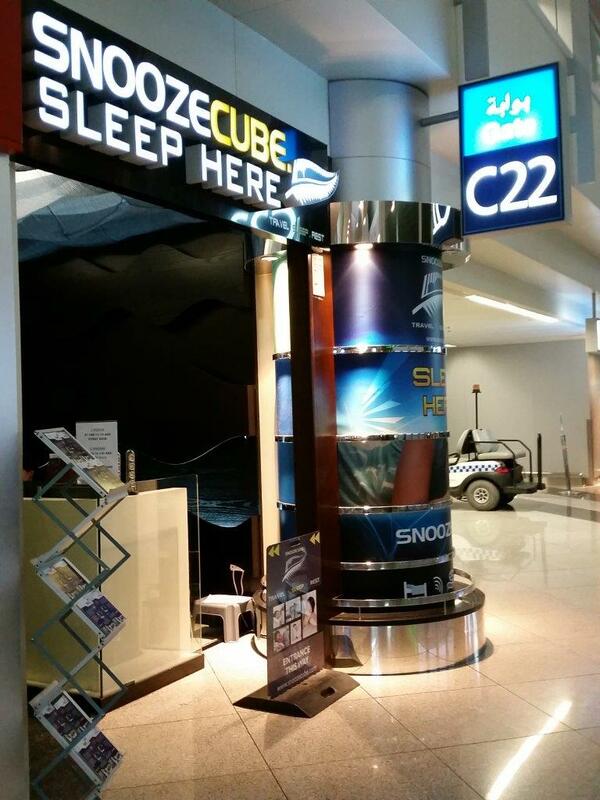 The Snooze Cubes at Dubai Airport are situated by gate C22 in Terminal 1. There are no toilets inside the area, but the closest public toilets are about 100 meter away. Here you will also find one shower (at least in the women’s bathroom). 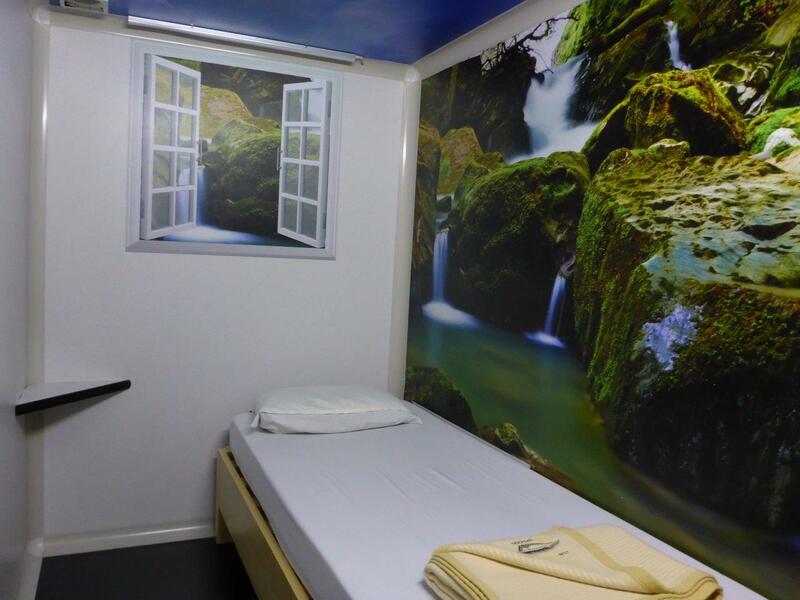 There are 10 Snooze Cubes available (some single and some double), and they can be booked directly on their web site. I actually had 13 hours transit, so I went downtown to watch the dancing fountains and having a drink with a view from AT.MOSPHERE Lounge in Burj Khalifa before returning to the airport to sleep. However, if you do decide to go out, please remember that you then must be checked in all the way through to your final destination, and hold a boarding pass for your onward journey to get back in again at any time you wish. If not, you will not be able to enter again until check in starts. Also, even though the Snooze Cubes are situated in Terminal 1, you have to enter at the terminal your flight will leave from, and then transfer from there. Enjoy your sleep, I certainly did! So cool, added to bucket list!! You are amazing BTW. Så kult! Slike overnattingssteder er jo helt geniale. Jeg bodde i noe lignende på flyplassen i New Delhi. Godt å ha et sted å hvile kroppen mellom flyreisene uten stresset å komme seg ut og inn av flyplassen 🙂 Minnes å huske at jeg måtte betale pr. time da, så det ble ikke sånn superbillig dessverre. I had a good night sleep, but I can sleep basically anywhere. However, it is very basic and the toilet and shower is out in the terminal building, so if you are worried about the journalists expecting some more, I think I would go safe and book the hotel at the airport instead. As you actually have quite a few hours, the price will probably be more or less the same as well. But I have no problem reccommending the snooze cube anytime! I arrived in T3, and it is an easy walk between there and the cubes. Hi. Their rates are stated on their web site; http://snoozecube.com/prices. Enjoy your stay. Costs between 21 and 28 Usd per hour, so no cheaper than a hotel room, if not more expensive! The price for a single room is 21$ for a single room. 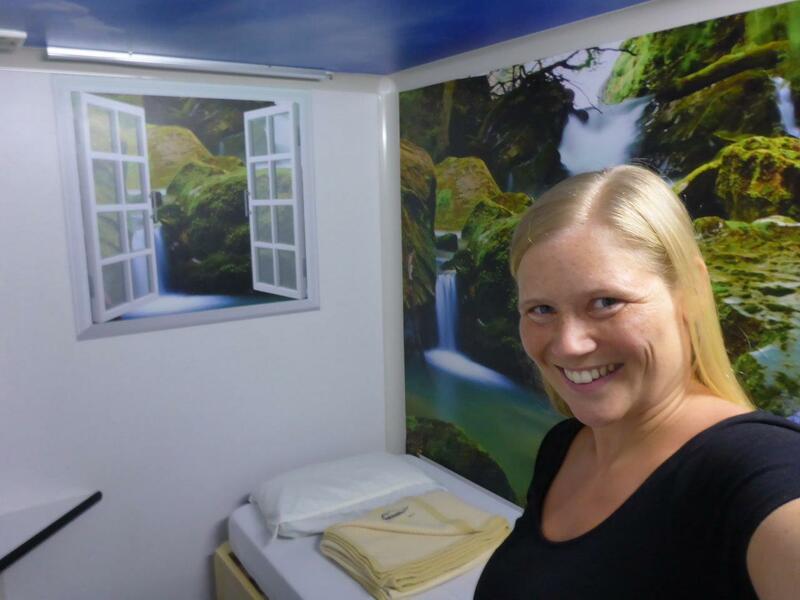 But the advantage of the snooze cubes is that it is located inside the terminal building, and can be rented for only a few hours if you have a short stopover. You will for sure find cheaper hotels outside the airport, but then you will waste valuable sleeping time as you have to calculate time getting to and from the hotel, and also back in through security. So it basically depend on what you prefer.